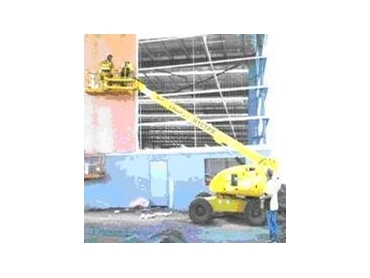 Telescopic Boom Lifts are ideal for areas which can not be accessed from close. Telescopic Boom Lifts have long horizontal reach and vertical reach of the booms which helps with those hard to reach places. An example of Telescopic Boom Lifts’ use is reaching out to the top floors of apartment buildings. All Auslift Crane & Access Hire’s Booms have Australian Compliance including all safety harnesses and equipment and are regularly serviced and checked to ensure reliable performance and safety. Also all Auslift Crane & Access Hire’s straight booms come with a built in generator for convenience. Auslift Crane & Access Hire covers all of Victoria and Melbourne. Auslift Crane & Access Hire incorporates many years of experience and services across a wide range of industries including maintenance, production, mining and construction. Auslift Crane & Access Hire also has its own erection crew for all panel and steel erection. Auslift Crane & Access Hire can assist with all mobile crane needs for lifting items anywhere up to 300 tonne. No job is too big, no job is too small. The helpful crew makes all lifting requirements a priority. Auslift Crane & Access Hire has good erection crews in Melbourne and all its staff have been ticketed and trained. Together with their experience and know how in the industry there is nothing too difficult for Auslift Crane & Access Hire’s crew. Auslift Crane & Access Hire has a full range of rough terrain diesel scissor lifts. Scissor Lifts are especially useful for working up alongside buildings or even indoors as these machines are compact. Auslift Crane & Access Hire’s Scissor Lifts starts from a slimline model which fits through standard doorways right up to a 4WD 50ft scissor which gives a much bigger working area. All Auslift Crane & Access Hire’s Scissor Lifts meet Australian compliance and are regularly serviced and checked to ensure safe and reliable operation.